This richly textured cultural history of Italian fascism traces the narrative path that accompanied the making of the regime and the construction of Mussolini's power. Simonetta Falasca-Zamponi reads fascist myths, rituals, images, and speeches as texts that tell the story of fascism. Linking Mussolini's elaboration of a new ruling style to the shaping of the regime's identity, she finds that in searching for symbolic means and forms that would represent its political novelty, fascism in fact brought itself into being, creating its own power and history. 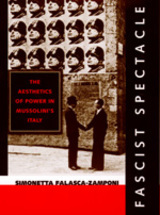 Falasca-Zamponi argues that an aesthetically founded notion of politics guided fascist power's historical unfolding and determined the fascist regime's violent understanding of social relations, its desensitized and dehumanized claims to creation, its privileging of form over ethical norms, and ultimately its truly totalitarian nature. Simonetta Falasca-Zamponi is Assistant Professor of Sociology, University of California, Santa Barbara.